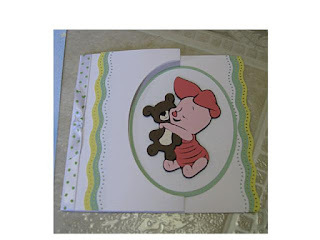 Randi's Crafty Creations: May Class Project "Piglet Card"
May Class Project "Piglet Card"
For this card I used Magic Wanda's (from the Cricut MB) idea from her heart cut file, however I did not use the cut file. I used the centerpoint feature on the expression machine with the eksuccess punches to achieve the same result for my piglet card. Thanks Wanda for the inspiration. This is so cute! I love Pooh and Piglet is my favorite! My emails to you are bouncing back...help! What a sweet card. I just love piglet!! TFS!! May Class Project "Magical Makeover"